Nowadays, of course, it’s become common to hear talk about the “blue wall” — the set of 18 states that, along with the District of Columbia, have voted for the Democrat in each of the most recent six presidential elections, from 1992 through 2012. Together, they represent 242 electoral votes. 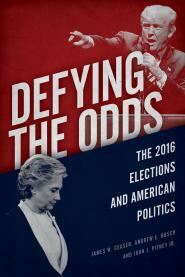 Many pundits, ignoring the lessons of history, claim the “blue wall” or some close variation of it puts the Democratic nominee (likely Hillary Clinton) at a substantial advantage for 2016. The error that these commentators are making is in attributing the Democrats’ recent run of success to the Electoral College. In fact, the Electoral College has been a minor factor, if it’s helped Democrats at all, and one probably best ignored until the late stages of a close presidential race. But wait. Wasn’t Barack Obama’s margin in the Electoral College in 2012 — 332 electoral votes, to Mitt Romney’s 206 — awfully impressive given that he won the popular vote by only a few percentage points? Actually, it was pretty much par for the course. The nature of the Electoral College is to accentuate small margins in the popular vote; Obama’s electoral vote tallies have been fine, but historically ordinary. But for now? The Electoral College just isn’t worth worrying about much. If you see analysts talking about the “blue wall,” all they’re really saying is that Democrats have won a bunch of presidential elections lately — an obvious fact that probably doesn’t have much predictive power for what will happen this time around. I’m not saying Clinton is doomed. Rather, I think the “fundamentals” point toward her chances being about 50-50, and I wouldn’t argue vigorously if you claimed the chances were more like 60-40 in one or the other direction. But Clinton is no sort of lock, and if she loses the popular vote by even a few percentage points, the “blue wall” will seem as archaic as talk of a permanent Republican majority.